This page gives the opportunity to show some of your latest - and not so new - Rowden family photos. If you have a suitable photo then please email it to me. Congratulations to Rachel Rowden for her part in carrying the Olympic torch in Cliftonville, Margate. More on Youtube. 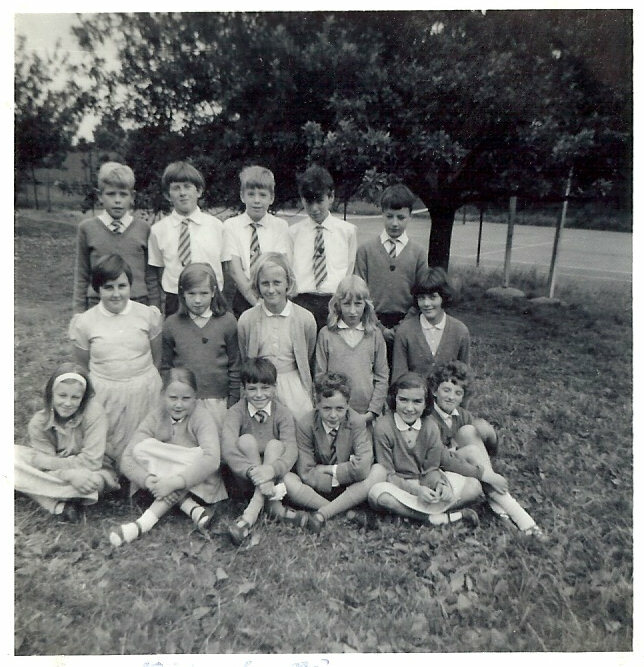 Old school photos can be quite revealing especially when they haven't been seen for a while. This one from the mid 1960s shows 'yours truly' as a slip of a lad... (yes, but which one?). Seems like the other day! James Rowden began work as a Lad Porter in April 1880 on London & SW Railway at 16 years of age. In an era when few photos were taken his employment record includes some interesting personal details. Many years later he became a Railway Inspector. 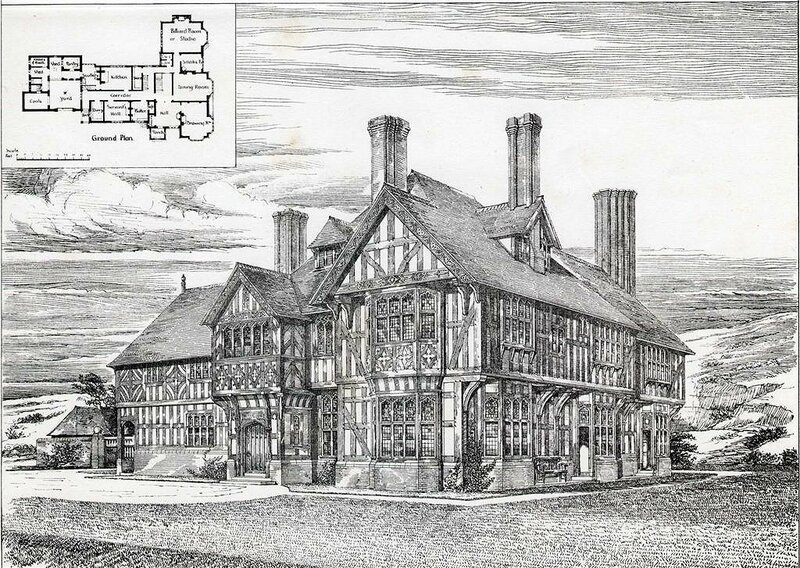 Rowden Abbey Manor house was built in the 19th century in Bredenbury, Herefordshire, UK but this was some time after the Herefordshire Rowdon family had died out in the area. 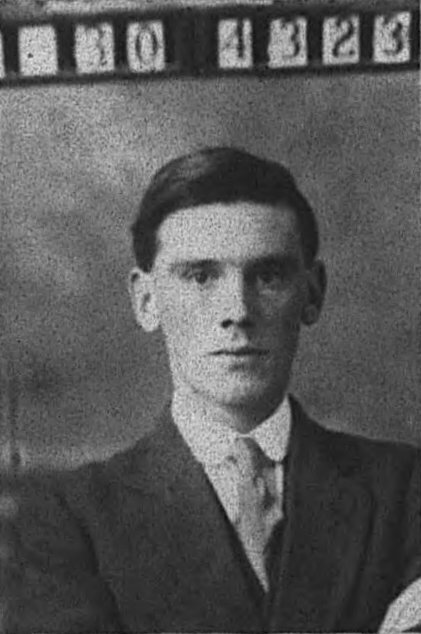 Samuel James Rowden was a seafarer from Dublin. His mariner records from the Registrar General of Shipping and Seaman (recently made available) include a photo at the age of 25. 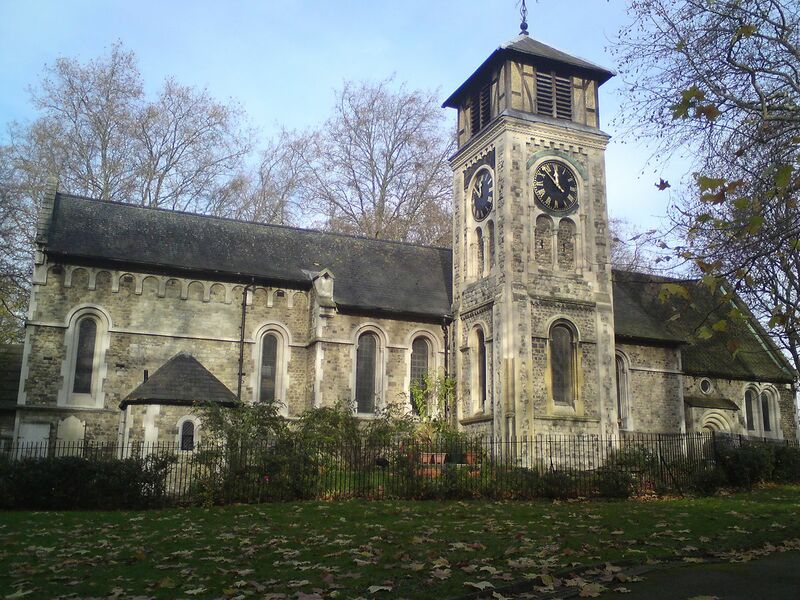 The church most used for the life events (christenings, marriages and burials) of Rowdens in London is probably St Pancras Old Church. The church site is one of the oldest in the UK and is found just north west of the London railway station of the same name. In 1864 Elizabeth Rowden married James Edward Vicary in Crediton, Devon. During the 1980s I was sent a bottle of perfume which was in current production, by one of Elizabeth and James's grandchildren. 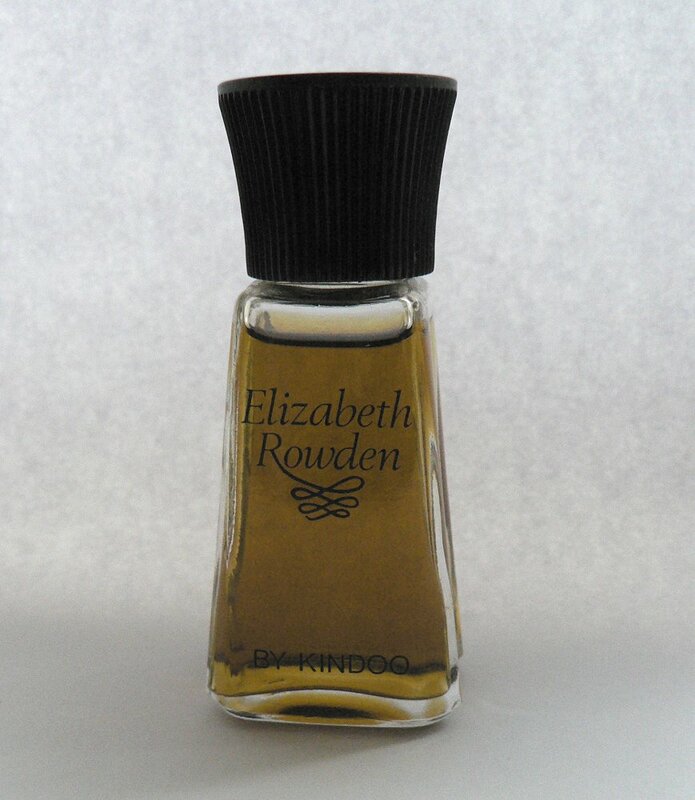 This week's image shows the perfume which was named after Elizabeth. Emigration to 'new lands' was very popular in the 19th century for a number of different reasons. However the regulation of such movements was not as we know it today. 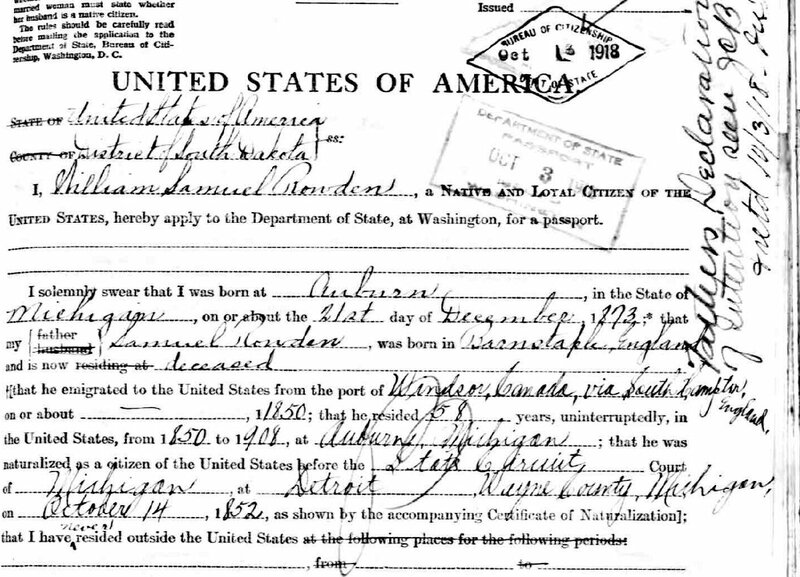 This image is an extract from a US passport application for William Rowden whose father Samuel had emigrated in 1852. In August of 1876 Emma Rowden married John Harnack in Lambeth, Surrey. In Royal Wedding week it seems appropriate to mention that John was a valet to HRH Duke of Connaught, Prince Arthur, the third son of Queen Victoria. 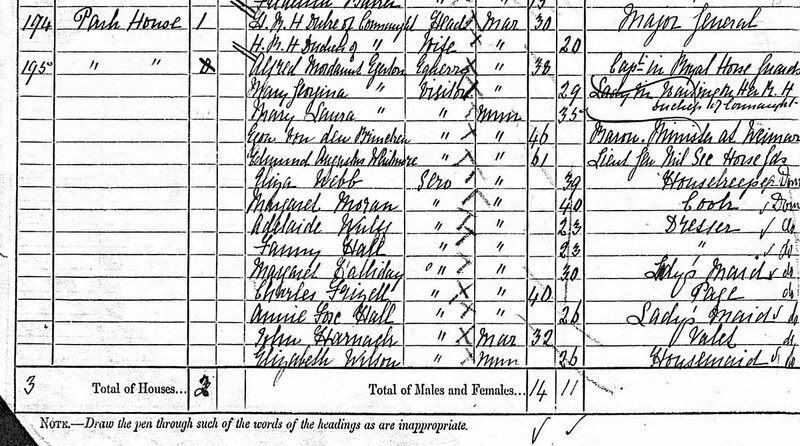 This is the census image of the household from 1881. Last night the 2011 census was taken throughout the UK. 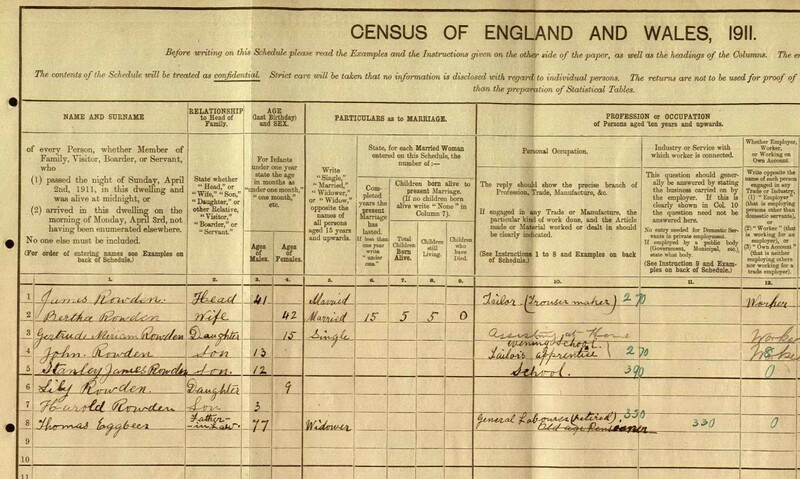 100 years ago the census was taken on the night of 2nd April. The photo this week shows an extract of the census record of my great grandfather's family. He worked as a tailor living in Exeter. 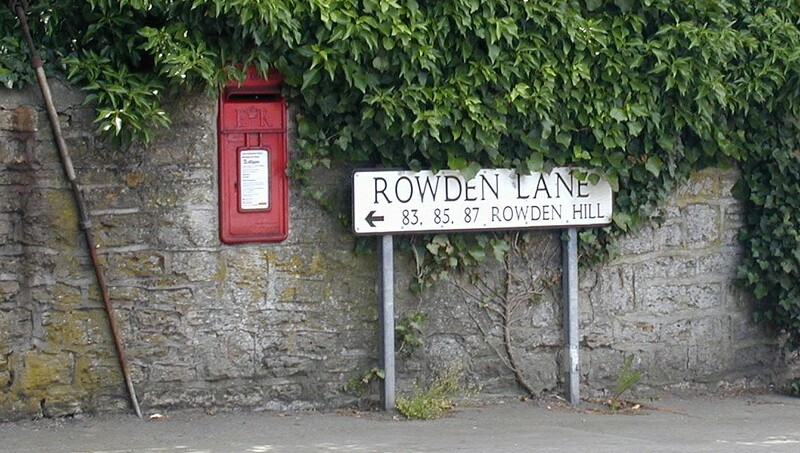 The family name Rowden or Rowdon is derived from two Old English words ruh and dun. Thus the surname was given to people who lived in places know by that name i.e. William of Rowden. There are many places in the British Isles and around the world which are known by this name still. 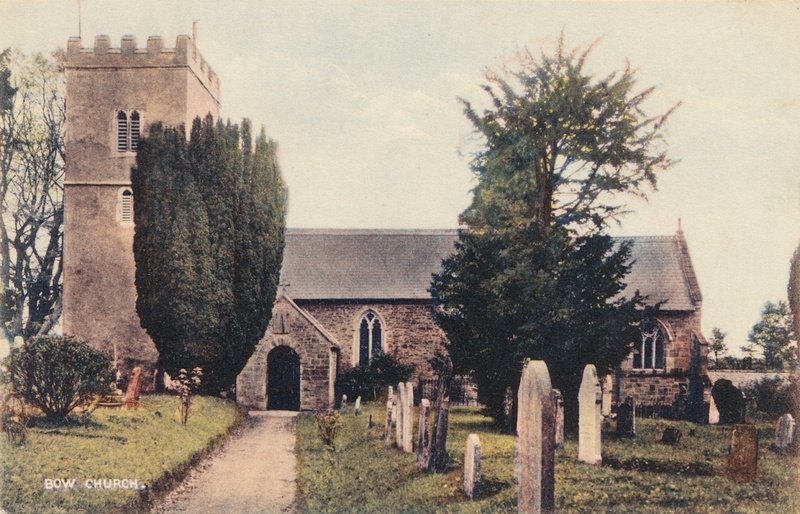 The parish church in Bow in the county of Devon, England has hosted the most Rowden life events of any church; including baptisms, marriages and burials. This early colour postcard shows St Bartholomew church as it was some time ago. The yew trees either side of the path now stand high above the headstones which include Rowden burials. 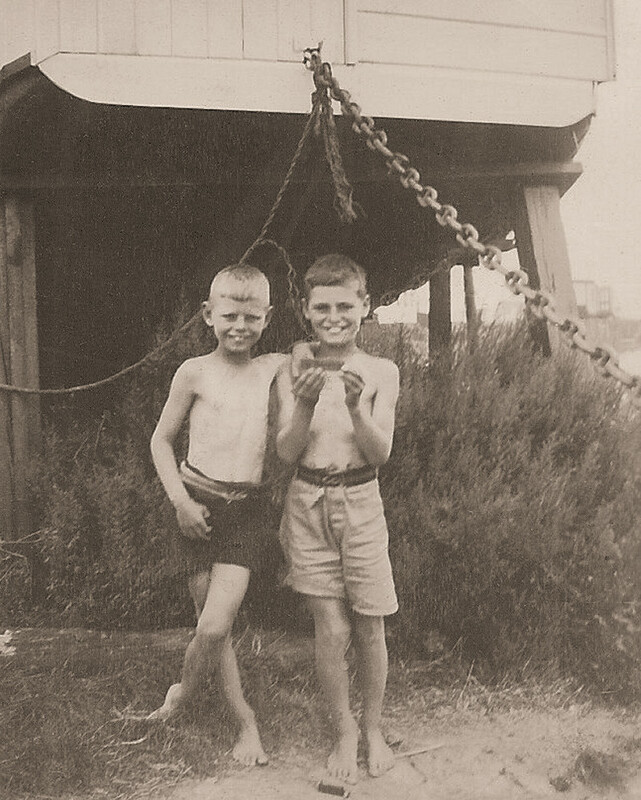 A splendid photo of two brothers Bob and Jim Rowden in the early 1930s. While not a photo of wonderful clarity it portrays a great sense of mischievous boyhood. Frances Arabella Rowden was born in the late 18th century and appears to have had a privleged life; she married in 1825 in Paris. 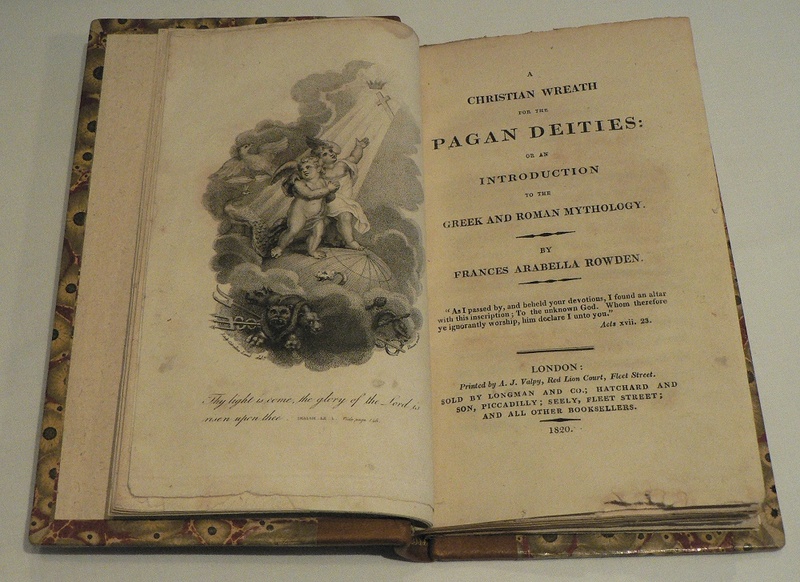 She wrote a few books on various subjects and this week's photo shows the titile page of her writings on pagan deities. Inside the cover of this book is a hand written date of September 1823. Wiltshire born William Rowden was a surgical cutler who set up his business in Northampton, England. 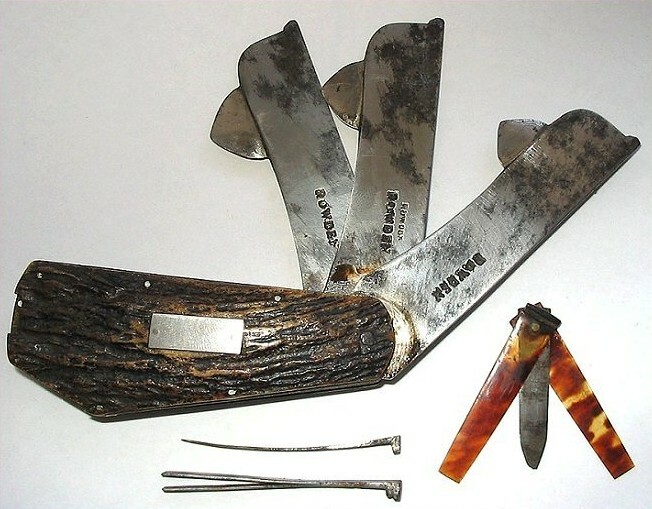 This photo shows one his fleaming knives which was used by vets and stock owners to bleed animals to release pressure. 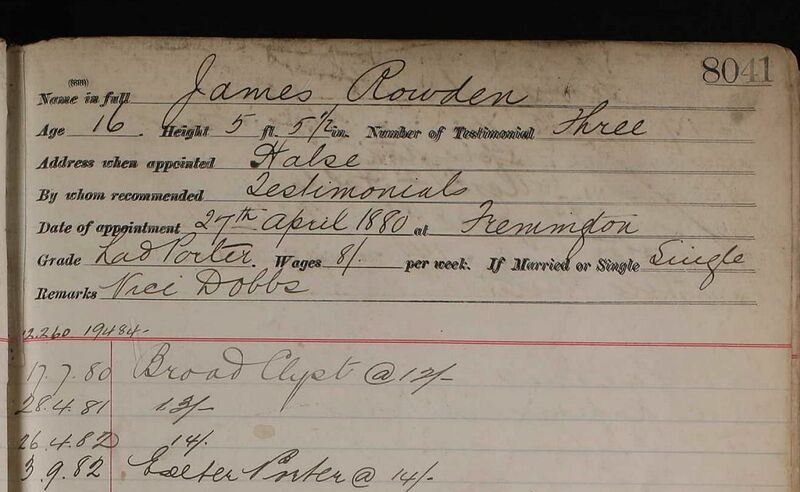 Jasper Rowden was baptised on 1st September 1728, the eldest son of Thomas Rowden and Elizabeth Gooden, and like his father and grandfather, became an oyster dredger at Whitstable. He married Ann Howard in April 1761, and following her death in March 1775, was married a second time on 24 December 1775 to Sarah Tanner. He was buried on 18 December 1794. 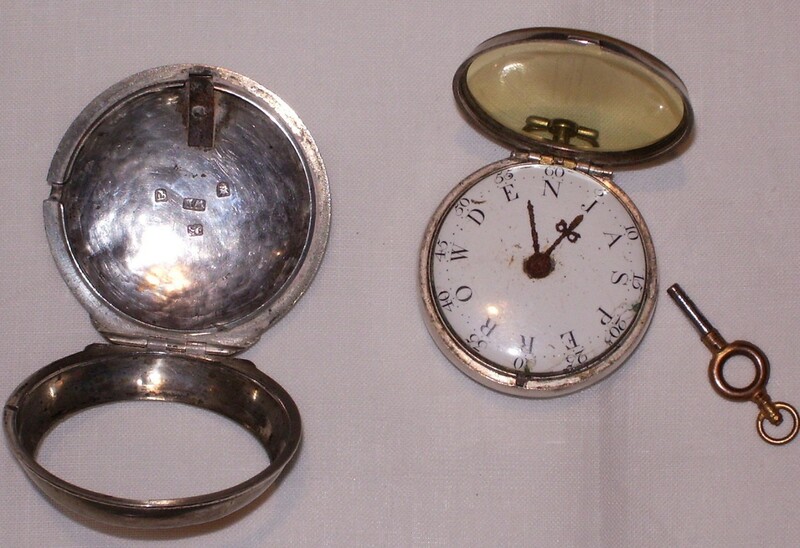 From records at Canterbury, we learn that on the 13 November 1775, Jasper Rowden was appointed to the office of Water Baliff for Viscount Lord Bollingbroke who was Lord of the Manor in Whitstable, and it is surmised that Jasper had this watch made in keeping with his new role. Among�Viscount Bollingbroke's possessions was the Manor of Whitstable, which included the rights to the Whitstable Oyster Fishery. The manor was sold in 1791 and the fishing rights were bought by the fishermen themselves the following year. In 1793 the company was incorporated by Act of Parliament as the Free Fishers and Dredgers. Thomas Rowden was water colour artist who painted many moorland scenes. 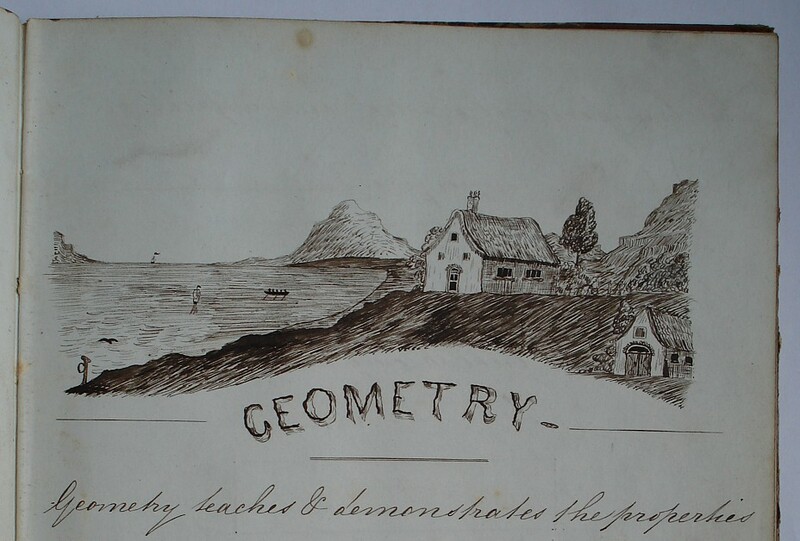 His flair for drawing was demonstrated even as a boy; this photo shows a extract from his school geometry exercise book - circa 1858. Christmas pudding is being prepared 1961 style. 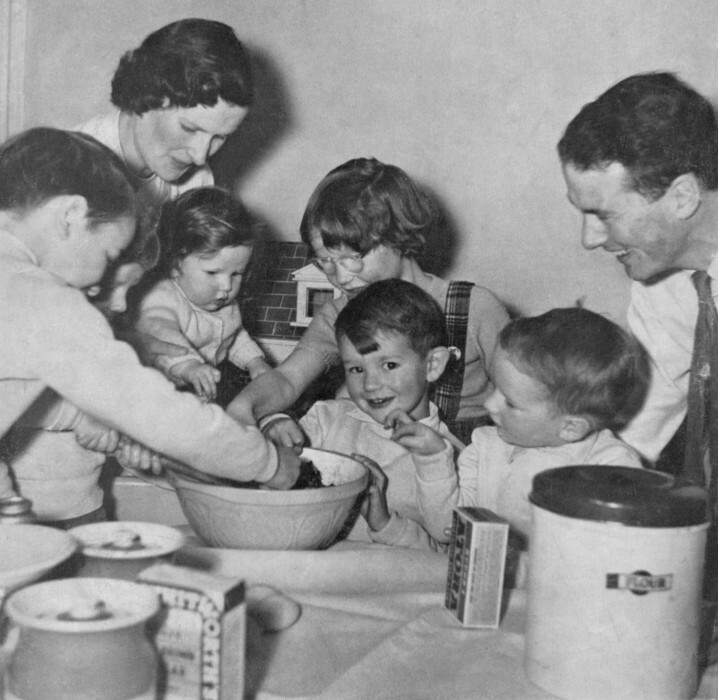 My parents are surrounded by my siblings as we all take a turn to stir the pud! Headstones in cemeteries provide the family historian with very useful information. Often it may be the only remaining source of certain information. This photo is of a headstone in the churchyard at Holy Trinity, Barnstaple. Being made from slate it remains in good condition in spite of its age. Records show a Rowdon family living in Coberley in Gloucestershire, England for some while during the 16th and 17th centuries. 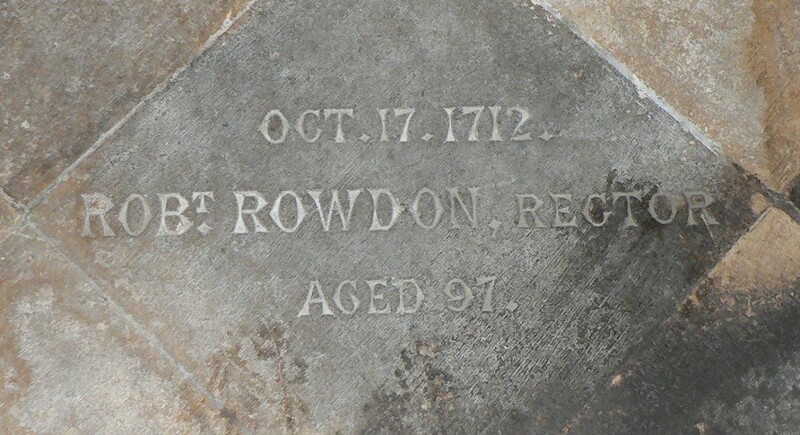 Robert Rowdon was the Rector of the parish and he died in 1712, aged 97. A memorial stone to Robert is set into the floor of the church along side 5 similar Rowdon stones which include an earlier Rowden rector. Robert's life was threatened by Roundheadsoldiers in November of 1643. In an attempt to prevent clandestine marriages, the issue of banns or licence was a legal requirement in England from 1754. 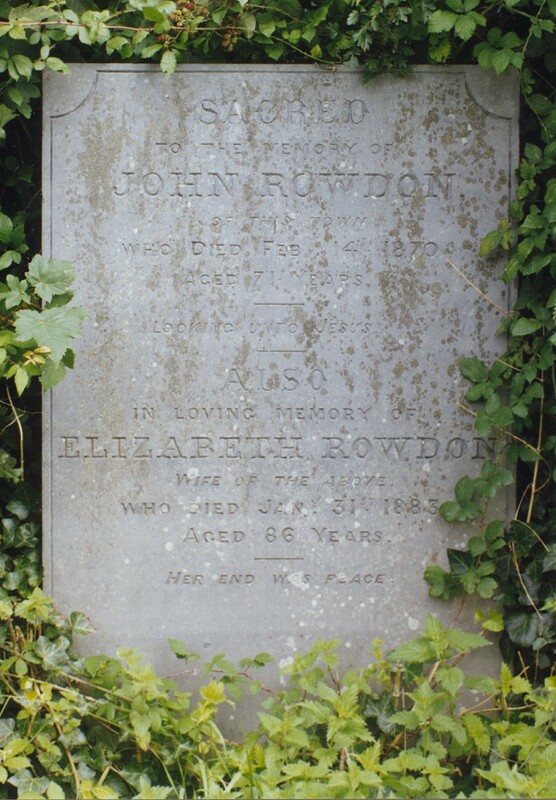 Almost 230 years ago, in July of 1780, James Rowden married Mary Vincent by licence in Honiton, Devon. 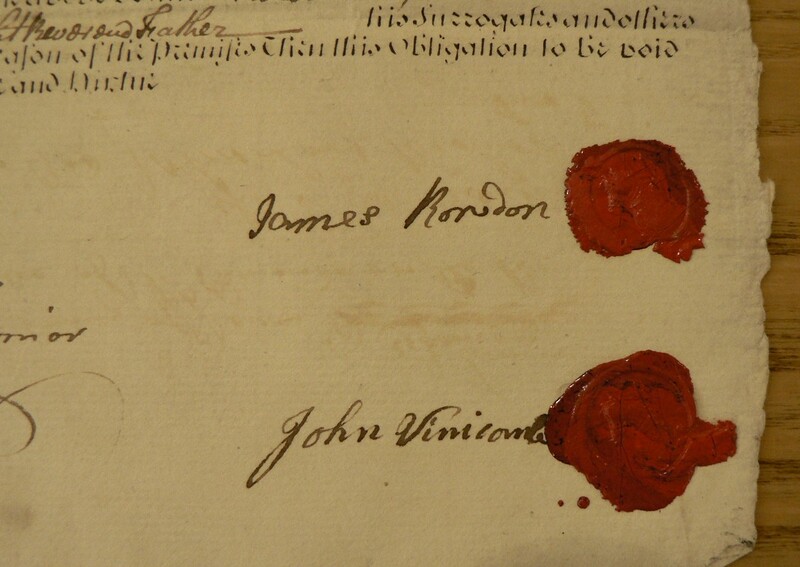 The marriage licence was issued on 30th July that year and this week's photo shows where James penned his signature at the bottom of the document. Highworth is a busy little market town near Swindon, in north Wiltshire, England. Edward Rowden was vicar of the parish for many years until his death in 1869. The memory of his family is kept alive by the stained glass windows about the church particularly on the north side of the nave. This pair of windows are in memory of Edward's first wife Elizabeth, who died in 1825 barely a week after the birth of their ninth child. 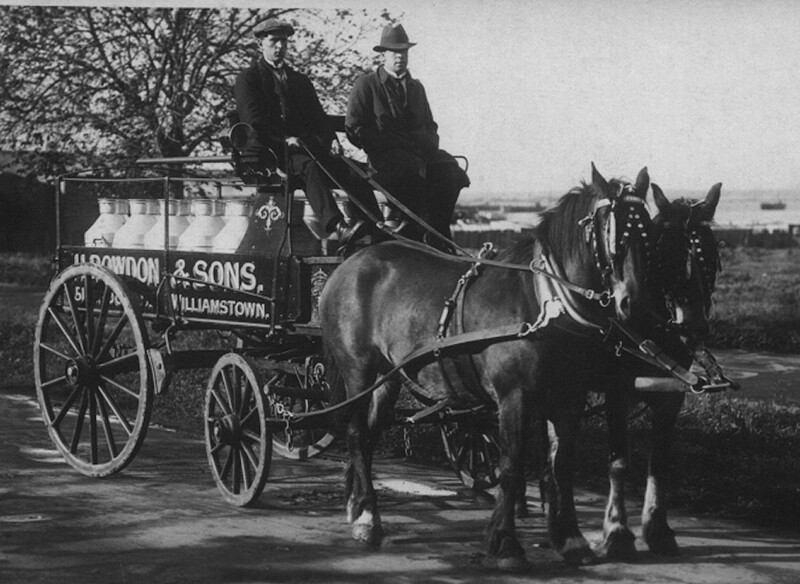 Arthur William Rowden was born in Whitstable Kent in 1872. 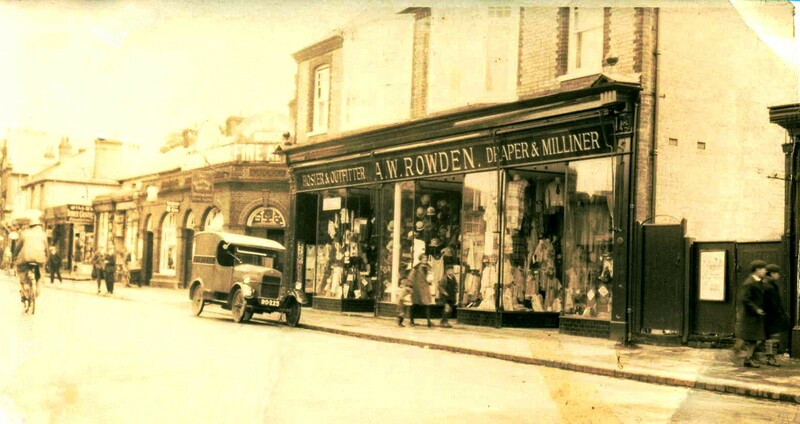 He ran a draper's shop in Hemel Hempstead, Hertfordshire, England and this week's photo shows it in the late 1920s. A photo of Arthur and his wife Alice may be found in the Sept 51 gallery. minds us of their sacrifice. Marking the week in which the Armistice was signed this humble, but well cared Briitsh cemetery at Le Vertannoy in France is tucked into the corner of a field. 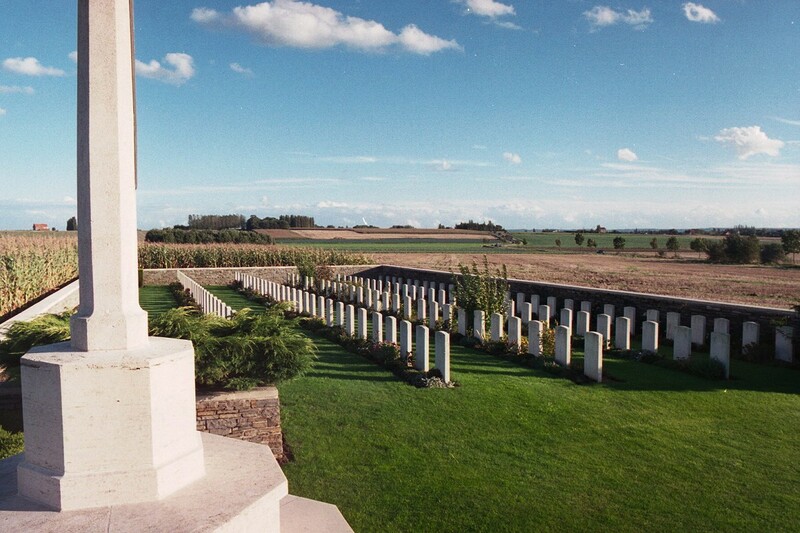 It is typical of many hundreds of burial grounds along the Western Front, which commemorate the loss of so many men in their prime and is the resting place of Sidney John Rowden. Weddings are usually a great opportunity to bring the family together. 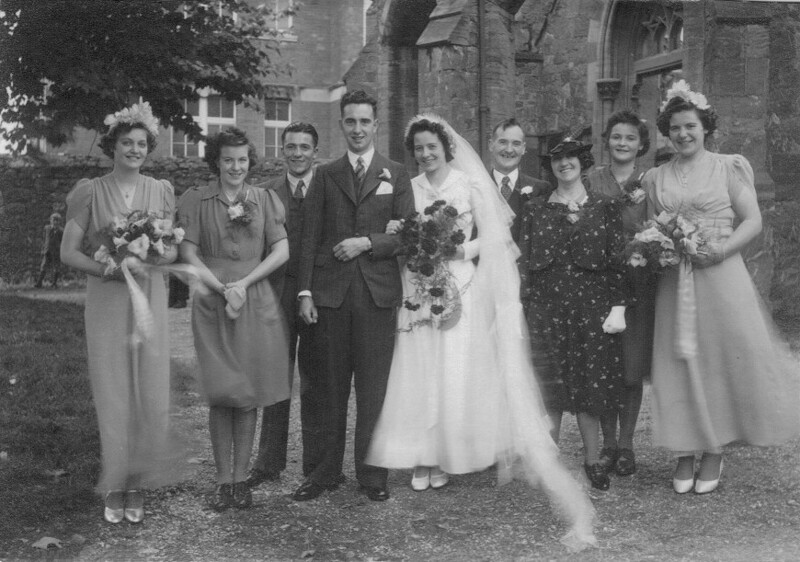 Here on their day in 1944 are Michael O'Shea and 21 year old Betty Rowden surrounded by Betty's immediate Rowden family, including Dad and Mum, William and Annie Rowden. 'T S Rowden & Son' was a family grocer and tea merchants in Kingston on Thames, London. It appears that Thomas Rowden opened his shop about 1870 and continued trading for 50 years or so. Eventually he opened a second shop with one in Richmond Road, the other on Kingston Hill. 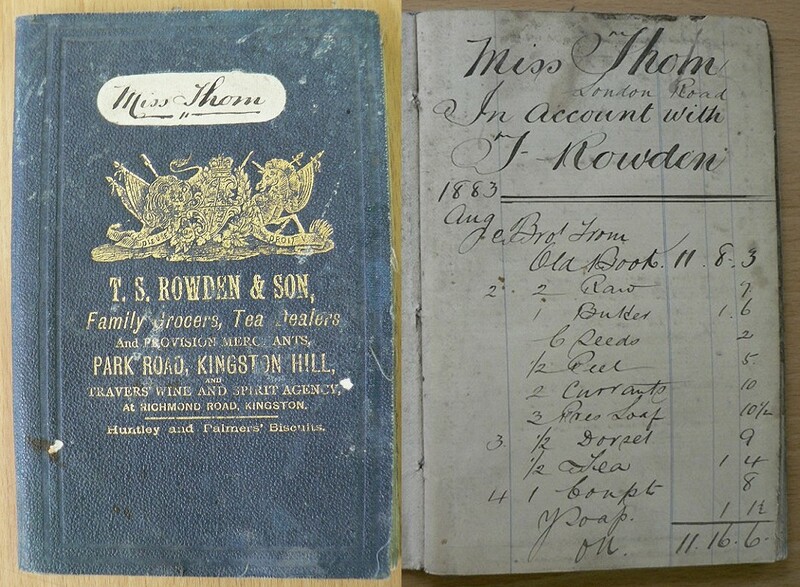 The photo shows a store account book for a customer, Miss Thorn. The book was recovered from a chimney during house renovations in the 20th century and is held by the Kingston Local History Room. Born last week, Joseph Rowden is the very latest addition to the Rowden family. 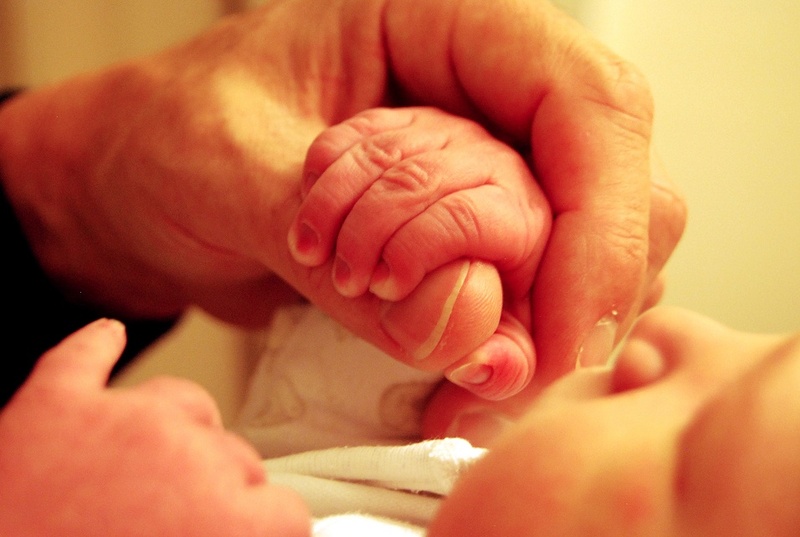 This photo, taken when he was just one day old, shows him holding his Grandad's hand.